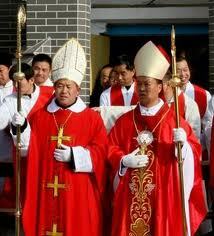 Bishop Wei Jingyi, bishop of Qiqihar, defines illicit ordinations as wounds in the body of the Church of Christ. Solidarity with the bishops forced against their will to participate in events organized by the Chinese government. Beijing (AsiaNews) - Mgr Wei Jingyi, underground bishop of the diocese of Qiqihar (Northeast China), today expressed his support for the statement against the Eighth Assembly of the representatives of Chinese Catholics published yesterday by the Vatican. In a pastoral letter Msgr. Wei urged the faithful to pray more for the Church in China which is going through “a particularly difficult time", as expressed last December 1 by the Pope in his call for the Chinese Church. Besides the convocation of the assembly, Bishop Wei cited the illicit ordination in Chengde held before the Christ the King feast day, which gravely violated Church regulations and doctrine. The act of ordaining illicitly “seriously wounded the Church and cast a wound in the Body of Christ. We also have to admit the Chinese religious policy is a serious setback,” he said. The Bishop points out that in the face of the convocation of the Dec 7-9 assembly, during which the leaders of the two organizations were elected (the president of the council of Chinese bishops and leader of the Patriotic Association), “we expressed sympathy and concern” for those were coerced to take part in the illicit ordination and the assembly. In response to the Pope’s call to prayer for the Church in China, Mgr. Wei called for his faithful to have adoration of Blessed Sacrament, to recite the rosary and to ask to Mary, Help of Christians and Our Lady of China, as well as to St Joseph to make intercessions for the Church in China. Meanwhile, a priest in mainland China told AsiaNews today that the Holy See has shown some “gesture of firmness in Church principles”, and that it will “restore confidence” in the authority of the Holy See as faith is the heart of the Church. Another priest also said the communiqué is “like a ray coming out before Christmas”, a good time for the Church in mainland and the government to reflect. Some of the faithful are concerned, however, about the intervention of the authorities during the Christmas celebrations and stressed that it would have been better if the message were released after the holidays.